February 2013 - It's that time of the year again when throngs of toy fans, toy creators and toy buyers worldwide converge onNew York City for the International Toy Fair. 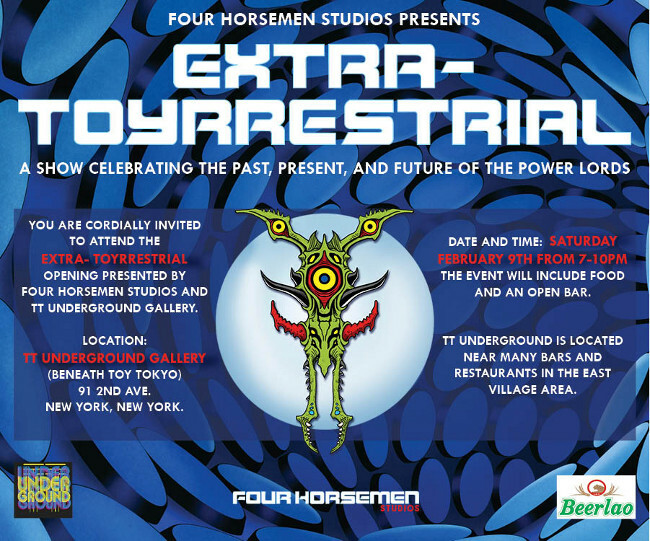 For the third year in a row during this time, the art gallery TT Underground and Beerlao will be hosting the Four Horsemen as they bring you Toypocalypse 3: ExtraTOYrrestrial!! This is the Four Horsemen's third annual gallery show featuring their work past, present and future, and this year Toypocalypse revolves around their newest licensed property - The Power Lords! The Power Lords was a toy line from the 80's that seemed to be a bit ahead of its time, but it has a very loyal fan base that have been hoping for its return. With the launch of the Power Lords website (http://www.PowerLordsReturn.com), it was announced that the Four Horsemen now have the license to create new Power Lords toys and other merchandise, and this show will reveal early prototypes of some of the upcoming Power Lords characters!